Monday April 7th 1884 It snowed last night and was so cold and wintry this morning I was at home all day but Mother went over to Hatts in the afternoon. Julia and I made some changes this morning and Mother and I will sleep down stairs after this. 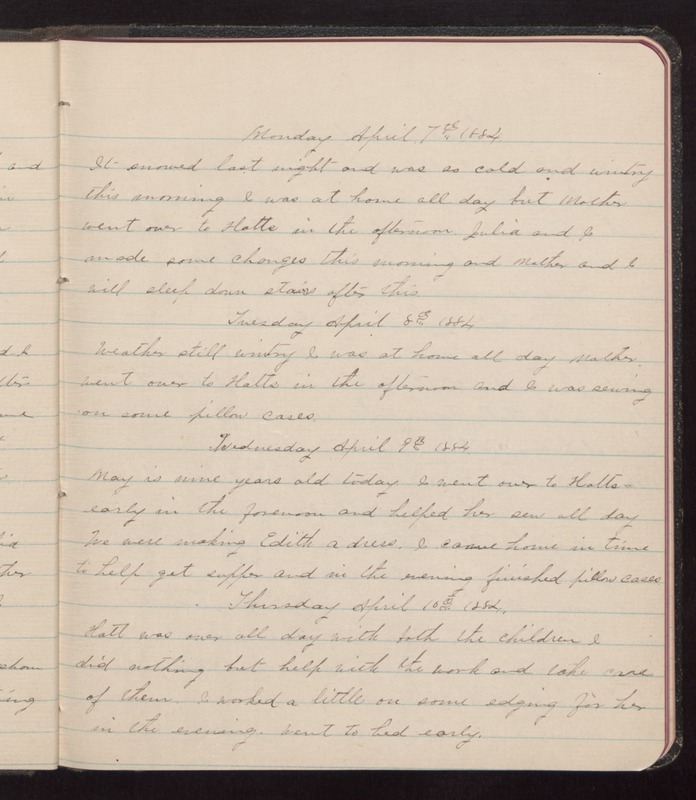 Tuesday April 8th 1884 Weather still wintry. I was at home all day. Mother went over to Hatts in the afternoon and I was sewing on some pillow cases. Wednesday April 9th 1884 May is nine years old today. I went over to Hatts early in the forenoon and helped her sew all day. We were making Edith a dress. I came home in time to help get supper and in the evening finished pillow cases. Thursday April 10th 1884 Hatt was over all day with both the children and did nothing but help with the work and take care of them. I worked a little on some edging for her in the evening. Went to bed early.